H.E.R.O. 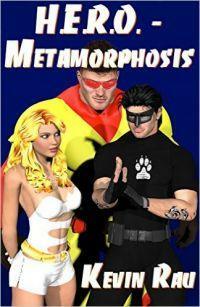 - Metamorphosis kicks off the most extensive, continuous and ongoing superhero series of the last decade, if not longer! This novel is a standalone book, but it introduces the new world, the city of Metrocity, and the core heroes involved in over 1.7 million words throughout the series. It functions much like a television series or comic book series, with intertwining plots and characters throughout. H.E.R.O. - Metamorphosis follows the story of three people - Stephanie, Lance, and Rael. They find they are changed into supers, along with others in Metrocity, when a meteor shower unleashes radiation above the city. The friends discover that they become a psychic, a brick, and a mutant. They must cope with the changes to their everyday life, friends and college as they discover the new powers at their disposal. In the midst of trying to become heroes and dealing with the changes to their normal lives, a mutant villain captures many new supers in a bid to build an army for herself. The H.E.R.O. series is a new supers universe of heroes and villains. As a novel-based story forum, it allows for deeper character development than that of a comic book or graphic novel based story. At the current point in the universe, supers have existed for about twenty five years. The H.E.R.O. organization - the Homeland Extraordinary Response Organization - allows for a loosely operated environment for the heroes to operate without being vigilantes. The common super types include Psychics, Blasters, Bricks and Mutants, although some crossover occurs in unusual individuals. Psychics generally gain mental powers, such as telepathy, telekinesis, or emotional powers. Blasters have the ability to generate or control an element or waveform, such as light, electricity, or heat. Bricks are the strongmen of the world, having massive strength and bodies that can sustain immense damage. Mutants appear less human in appearance due to the addition of blades, tentacles, fins, wings, tails, and more to their bodies, and are between a brick and the others in physical strength. "... I just couldn't stop flipping the pages of HERO. H.E.R.O. - Metamorphosis by Kevin Rau is a great book I just finished reading. The story revolves around three college-aged kids named Stephanie, Rael, and Lance that suddenly find themselves with superpowers. Another huge bonus is that this first book is available as an ebook for free on Amazon. I found this book to be highly enjoyable. I have read a ton of comic books over the last 30 years and a few books about superheroes and found this to be among the best. Why you may ask, let me tell you. The author does a great job of developing the three main characters and describing the physically and emotional impacts of suddenly gaining superpowers as a young adult. These three friends find themselves confused and in pain as their bodies go through a massive transition after a meteorite crashes into the mall they are hanging out at. Lance, already a very large, strong young man finds himself growing significantly more muscle and has difficulty touching anything without crushing it. He is considered a brick and has the strength and jumping ability of a superhero such as Marvel's The Hulk. Stephanie grows out golden hair and gains the ability to read minds, telepathy, and flight. Think of her much like Marvel Girl, Jean Gray before she became Phoenix. Rael, who was already a high degreed black belt in several martial arts, gains significant speed, healing powers, and claws much like Wolverine. Together these friends quickly decide they want to use their powers to help others and join the H.E.R.O. superhero group. The group is interesting because it is very structured to organize and dispatch superheroes to various accidents and super villain locations much like existing police forces are dispatched today. I always enjoy reading stories about young main characters who are just starting their careers but have the drive, abilities, and heart to become special in their own way. Another series of books that have this same focus on young characters that this book reminds me of is Terrier by Tamora Pierce. H.E.R.O. - Metamorphosis by Kevin Rau is a great book I absolutely recommend for those that read comics and want to read a more in-depth story about superheroes. I also think that those that like fantasy novels in a modern setting and fast moving fiction will in enjoy this book also. Some reviews I have read have stated that this book is fairly light reading or even confusing since the author switches form 3rd person to 1st person in each chapter. I didn't feel that way at all though. I have read plenty of fantasy and superhero books and comics and found this story to be well-paced, well-written and enjoyable throughout. So it is no surprise at all that I give this book at 5 out of 5 stars. Why not try this book out for free on Amazon and you may find out like me that you like it enough to purchase the second book for only $2.99 like me.